Who do you think said that? Surely it must have been some wild-eyed Confederate battle flag waving Southern redneck, right? Wrong. It was Abraham Lincoln, who also supported a proposed amendment that would have expressly forbidden the federal government from interfering with slavery in states where it existed. But, Frank! Abe freed the slaves! Sort of. The Emancipation Proclamation did not apply in states, counties and parishes that remained loyal to the Union. They got to keep their slaves. Furthermore, Lincoln supported colonizing freed blacks, or deporting them outright. True, the Civil War (not really a civil war by definition, but that’s another story) did, thankfully, hasten the end of slavery in the United States; but the perception that Lincoln (and the North in general) acted purely out of altruism is revisionist history at best. The reality is that he was just another pragmatic politician (and apparently a racist to boot), making a politically expedient decision. Here’s another interesting quote: “If I thought this war was to abolish slavery, I would resign my commission and offer my sword to the other side.” That was Union General, and later the 18th president of the United States, Ulysses S. Grant, who owned slaves right up until the 13th Amendment. A lot of folks probably don’t like to hear this stuff, because it shatters the notion that the Civil War was simply a case of the benevolent and just North freeing the slaves and setting those crazed racist rebels in the South straight. In fact, prior to the war’s outset, more anti-slavery organizations and societies existed in the South than in the North, and the majority of Southerners did not own slaves. The conflict was born out of the same ideal—the freedom to self-govern—that gave rise to the Colonial secession from England a century before. Which side was at fault for causing it to escalate into all-out war is a subject of much debate and beyond the scope of this page. The point is, the average Confederate soldier was not fighting to preserve slavery; he was fighting to defend his home and way of life from invaders. To this day, many Confederates’ descendants in the South take great pride in preserving the story of their heroic struggle, just as we celebrate America’s war for independence from England. Some of them express that pride by flying the Confederate Battle Flag. There are a lot of people out there who don’t like that. They say it’s a symbol of racism. To those people I say, how the hell do you know why that guy flies the flag? Maybe it’s to honor his great great grandfather who fought off Union troops when they tried to burn his house down. Did you bother to ask? Or, did you just rush to judgment, assume he’s a racist and demand that he take down the flag? Where I come from, we call that prejudice. No, not you! 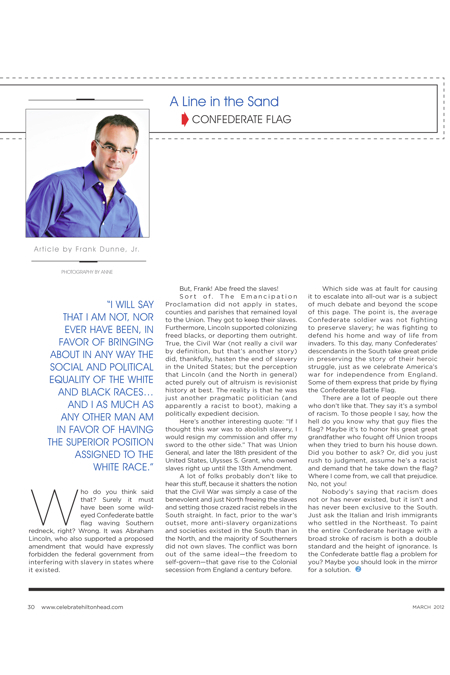 Nobody’s saying that racism does not or has never existed, but it isn’t and has never been exclusive to the South. Just ask the Italian and Irish immigrants who settled in the Northeast. To paint the entire Confederate heritage with a broad stroke of racism is both a double standard and the height of ignorance. 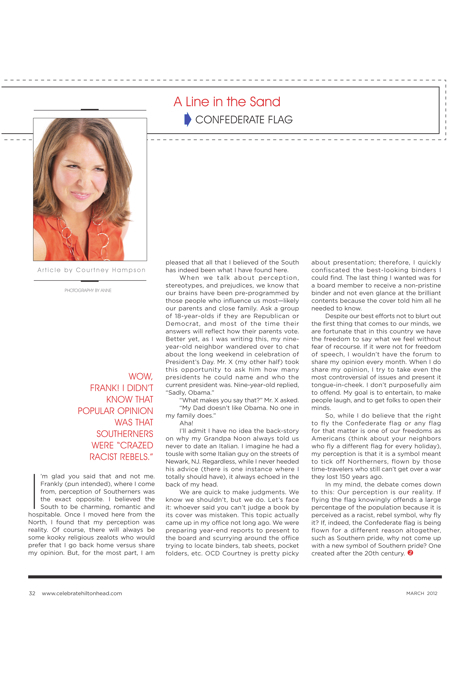 Is the Confederate battle flag a problem for you? Maybe you should look in the mirror for a solution. I’m glad you said that and not me. Frankly (pun intended), where I come from, perception of Southerners was the exact opposite. I believed the South to be charming, romantic and hospitable. Once I moved here from the North, I found that my perception was reality. Of course, there will always be some kooky religious zealots who would prefer that I go back home versus share my opinion. But, for the most part, I am pleased that all that I believed of the South has indeed been what I have found here. “What makes you say that?” Mr. X asked. I’ll admit I have no idea the back-story on why my Grandpa Noon always told us never to date an Italian. I imagine he had a tousle with some Italian guy on the streets of Newark, NJ. Regardless, while I never heeded his advice (there is one instance where I totally should have), it always echoed in the back of my head. We are quick to make judgments. We know we shouldn’t, but we do. Let’s face it: whoever said you can’t judge a book by its cover was mistaken. This topic actually came up in my office not long ago. We were preparing year-end reports to present to the board and scurrying around the office trying to locate binders, tab sheets, pocket folders, etc. OCD Courtney is pretty picky about presentation; therefore, I quickly confiscated the best-looking binders I could find. The last thing I wanted was for a board member to receive a non-pristine binder and not even glance at the brilliant contents because the cover told him all he needed to know. Despite our best efforts not to blurt out the first thing that comes to our minds, we are fortunate that in this country we have the freedom to say what we feel without fear of recourse. If it were not for freedom of speech, I wouldn’t have the forum to share my opinion every month. When I do share my opinion, I try to take even the most controversial of issues and present it tongue-in-cheek. I don’t purposefully aim to offend. My goal is to entertain, to make people laugh, and to get folks to open their minds. So, while I do believe that the right to fly the Confederate flag or any flag for that matter is one of our freedoms as Americans (think about your neighbors who fly a different flag for every holiday), my perception is that it is a symbol meant to tick off Northerners, flown by those time-travelers who still can’t get over a war they lost 150 years ago. In my mind, the debate comes down to this: Our perception is our reality. If flying the flag knowingly offends a large percentage of the population because it is perceived as a racist, rebel symbol, why fly it? If, indeed, the Confederate flag is being flown for a different reason altogether, such as Southern pride, why not come up with a new symbol of Southern pride? One created after the 20th century.